The racing tip from our intrepid cleaner and all round sport’s nut , Guru Pete, usually only appears on our Facebook page. However, this is the Melbourne Cup and we figure a wider spread of traders will be interested in an expert’s opinion so we here we go. We should point out that Pete is over $170 ahead if you had wagered $10 each way on his weekly tip since June this year. Good luck! What do you do/sell at the market? Aluminum giftware. How long have you been at the market? 14 years. What do you like best about the market? - Hanging out with traders. Worst moment? Customer giving false credit details. Sporting interests? Swimming and footy. If you were CEO for a day? I’d get all traders to do a survey to assess the general health of trade. Favorite TV show/ movie ? Big Bang Theory / Once Were Warriors. If you had your Sunday arvo free from the market, what would you do? Family boat trip. What one item would you take with you to a deserted island ? My iPhone. 1. Menswear look is seen as the new female fashion trend at this year’s fashion shows. 2. NAB quarterly September business review says retail sector remains weak. 3. Myer CEO Bernie Brookes has taken a million dollar pay cut. 4. Mattel has announced it is buying HIT Entertainment, owners of pre-school brands like Bob The Builder, Thomas & Friends and Angelina Ballerina. 5. Billabong counters big store own-brand philosophy by buying Australia's Surf Dive `n' Ski, Jetty Surf, Rush Surf and Surfection over past 12 months and retailing direct. 6. Woolworths reports Big W department store sales slide 4.2% store on store. 7. 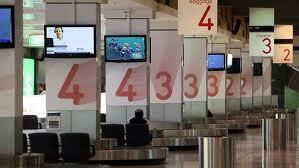 Flight Centre report 25-30% profit increase in September quarter as Australians continue to travel. 8. Australian dollar hits an 8 week high. 9. Qantas announce global shutdown due industrial action. Qantas’ decision on Saturday to shut down its global operations due to industrial action is a huge move with potentially significant repercussions for QVM traders. General Merchandise Traders rely on tourists for 70% of their business and the impact of our major airline shutting down is obvious. Qantas is objecting to the stop start rolling strikes over recent months which they say are severely damaging their performance and reputation. At least tourists have been able to travel during the rolling action but now Qantas customers will have to find alternative travel or stay at home. In a very complex issue we are only interested in one thing – how soon can a resolution be reached? UPDATE: 0900 31/10/11 - At a hearing over the weekend, Fair Work Australia has banned industrial action by the unions and the company and given them 21 days to complete negotiations. Qantas hope to be back in the air by Monday evening. 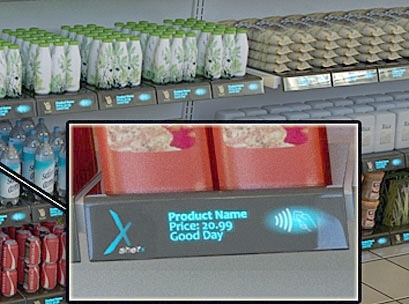 A US inventor has showcased a supermarket shelving system that does away with checkouts and cashiers. Perplexed at the constant queueing and waiting in supermarkets this inventor has come up with weight sensitive shelves that record your purchase as you take items from the shelf. Once you have completed your shopping list, you simply walk out of the store. Your purchases are recorded using radio frequency and tap-n-go type technology linking with your credit card or mobile phone. Prices are shown on digital displays at the front of each shelf which are centrally updated and stock is replaced automatically. Not something we are likely to see in market stalls in the near future but an interesting concept nonetheless. A new venture aims to establish short term pop-up markets on unused development sites in Melbourne City. Well OK, “stars” might be stretching things a bit, but John did get airtime on Fox FM when he presented Jo Stanley with a Certificate of Excellence from General Merchandise Traders at her pop-up market stall on Thursday 27th October. Jo’s stall was organised through the QVM marketing team as part of a Fox FM/QVM promotion. The radio presenter earned money for charity by selling a mix of handmade and recycled clothing and accessories on the Therry St. Plaza. The certificate was in fact a caricature of Jo by our own Ivano. The Commonwealth Bank is to introduce a new iPhone case that will allow payment at Tap-n-go contactless payment outlets. The case will include an NFC chip to facilitate the transaction and will come with software enabling payment by email and Facebook as well as more traditional smartphone functions like checking balances and transferring money between accounts. Contactless payment facilities aren’t exactly in every corner store yet but this looks the way of the future. I have a theory. We don’t get bad-customer days. We get lack-of-good-customer days. Don’t turn off just yet. My argument does get better. We all know our painful customers. Those that seem to be wasting our time, can’t make up their mind, or are just plain difficult. I believe they are part of our customer content on every trading day. They may be visiting the market for blue widgets but happen to pass by your red widgets and, mildly interested, they decide to have a look. There is no way they are going to buy today but they are bankable for later on and deserve our courteous attention. We can all be bad customers – just wandering into a store without any intention of buying. Of course, that doesn't really make us bad customers. It's just a normal part of the shopping process. The good customers come in and buy. They are focussed and ready to do business. If we get enough of them we feel good about our day and handling the bad customers in between is no real chore. If the good customers are missing, it is a different ball game and we struggle to maintain our friendly customer service approach. What’s my point? Don’t blame the bad customers for a bad day. Blame the good customers for not turning up. Put the bad customers in the bank for the future by being courteous and helpful. They will remember you when they are looking for red widgets. There - aren't you glad you kept on reading? Widget – an unnamed or hypothetical manufactured item. You will be aware that trader volunteers have responded to trader sentiment by circulating a petition to complain about the planned 3.8% rent increase for license holders. A leaflet outlining our concerns has been distributed to traders and is copied below. A meeting was held yesterday between trader representatives and QVM management. Vigorous discussion surrounded the points mentioned in our leaflet and we are now waiting on management to respond. In the meantime trader representatives will continue to circulate traders for support signatures. We are pleased to report over 95% participation. We intend approaching QVM management requesting a review of their intended Stall Fee increases. 1. We are already paying too much. General Merchandise Traders pay approx. 60% of the total Stall Fees of the day Market, but only get, at best, 20% of people coming to the Market. 2. Many of the “increasing operational costs” mentioned by Market Management are of no benefit to us, yet we still pay for them via our rental fees. 3. We are paying more for our stall but earning much less. 4. Melbourne City Council is already receiving more money than expected from the market, so why should we be giving them even more. 5. The market is claiming increased marketing spend and we say “It’s about time!” Years of inadequate promotion of the top end of the market needs correcting. When that marketing spend produces real results we will be happy to look at rent increases. 6. As for providing retailer training – we didn’t ask for more training. Management offered training as a “free” resource for traders. To now seek a rent increase to cover the cost is totally inappropriate. If you would like to speak to someone about your opinion or concerns on this matter, feel free to contact your Advisory Committee members. A fascinating article in Inside Retailing this week about some of the crap involved in branding, market research and business plans. To be quite honest, it was on a theoretical level just slightly above my intellectual ability, but I did get a couple of gems out of it. 1. 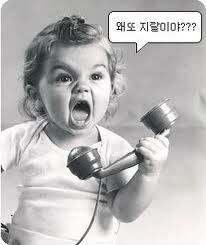 Talk with your customers regularly. This is an ability that the designers and backroom boys don’t have but retailers do have. By the time the backroom boys work out changes in customer sentiment it is too late. However, retailers get the current gossip and can react immediately. 2. Be adaptive. The bigger the ship – the harder it is to turn around. Smaller market traders have the advantage of being able to adapt quickly to current trends. It is nice to know we have one more advantage over bigger retailers. Footnote: There is a lesson for QVM management here. Policing our product mix around the market is desirable and we don’t want ad-hoc product content on stalls. However, a trader having the flexibility to adapt to changing consumer trends is also important. It is a fine line that requires great marketing expertise. 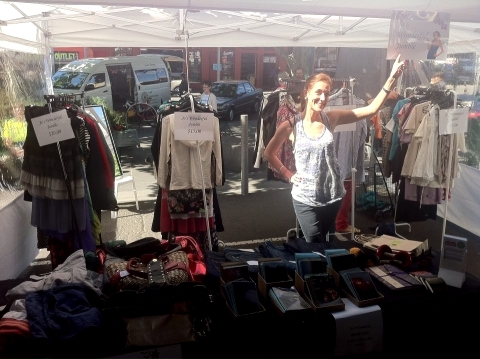 Fox FM radio presenter, Jo Stanley, set up a general merchandise stall at our market on Thursday 27th October. The stall was part of an on air challenge between Jo and fellow presenter Matt to see who could earn the most for charity. Jo was selling vintage, re-cycled and made from re-cycled items from a pop-up stall on the I shed/Therry St. Plaza. Given the nature of the merchandise we would have preferred to see her stall in the top end of the market and in fact management had offered positions in the General Merchandise area but Fox preferred the plaza site. We have asked management to keep us in the loop on future occasions so that perhaps we can help enhance the attractiveness of top end promotions. There was a significant amount of on air discussion leading up to the Thursday stall and the promotional value for QVM was significant. Traders welcomed Jo to the market by presenting her with a caricature of herself as an honorary General Merchandise Trader. 1. American Express claim Australians are second only to Mexico in their willingness to complain about poor customer service. 2. Sydney police seize over $1 million worth of fake designer bags from Parklea Markets. 3. Super Retail Group has paid $610m for 128 Rebel Sports stores . 4. 73% of Australia’s online spending goes to Australian websites. 5. Armani Exchange to open new store in Chadstone Shopping Centre. 6. Hairhouse Warehouse has been named Franchisor Of The Year. 7. Mastercard reports that Tap-and-go card technology is receiving quick customer acceptance. 8. Coles profit up, Target down, K-mart about even. What do you do/sell at the market? Suitcases and travelgoods. How long have you been at the market? – 22 years. What do you like best about the market? - Friendly Stallholders. Worst moment? - Rude customers. Past jobs? - Manager of clothing store in Russia. Sporting interests? -I go swimming 3 times a week. One thing nobody knows about you? I lived in Italy for close to a year. Favorite drink? - Plain natural water. If you had your Sunday arvo free from the market, what would you do. ? Take my family out for lunch. The QVM’s decision to increase pre-existing license rents by approximately 3.8% has drawn an unhappy reaction from General Merchandise Traders. In an environment of general restraint and high profile shopping centre rent reductions, the QVM action would seem inappropriate. Traders are expected to formulate a response to management and we will keep you informed of progress. I don’t want to denigrate the long term value of training courses but the answer to getting a better customer service attitude at the QVM is not just through a training course. There is something far more important. Get us more customers! Get us more feet past the front of our stalls and, importantly, make them tourist feet. More tourists means more sales, means more profit and that puts a smile on the face of traders better than any customer service technique will ever do. The debilitating impact of poor business on every traders psyche cannot be over estimated. It is difficult to present a bright enthusiastic face to your customers when bills are piling up, you are earning less than the minimum wage, stock levels are low, your product choices are no longer sure-fire sellers, you need staff assistance but you can’t afford it, and your customers are more inclined to save than spend. Then the QVM shows it doesn’t understand and puts your rent up. Our Lord Mayor has made statementsrecently about returning the QVM to its iconic No.1 tourist status. I think we all agree! But it is time for action and putting more hard money into tourism starting right here at the Queen Victoria Market. Although I have traded at this market for over 30 years I still get a tingle on the back of my neck each time I drive into the top end of J shed from Peel St. That tingle is anticipation. Will today’s episode in the big gamble called retailing produce a good result or disappointment? There are so many variables in our business. There are factors which we have little control over. Will the weather be kind? Will the right customers turn up? Is my competitor going to be more aggressive today? Are tourists in town? Then there are factors that we can influence. Will that new product get a good response? How am I going to display the new range? Will my salesmanship be at its best today? Have I got the right stock for today’s customers? Have I bought well? Much of what we do depends on our knowledge and experience. While our daily sales performance is largely dependant on all the qualities we bring as retailers, there are enough unknowns and factors outside our control to add an excitement that few other jobs can bring. It is probably the reason why we back up after really bad days with a fresh optimism. We know that the next big sale is around the corner. We know that we can be surprised by events on any day. 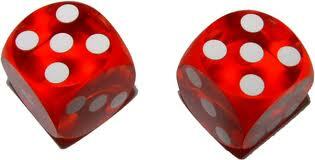 That is the gambling aspect of retailing – and it is a real buzz. The Aussiehost Customer Service Course held in the Flagstaff Gardens on Wednesday was attended by a number of traders including Leah and 6 month old son Austin. The course was memorable for two main reasons. Firstly, young Austin was the best behaved attendee. Not bad for a 5.5 hr course although there were plenty of spare hands to help look after him. And secondly, all attendees agreed this was one of the best training courses we had ever been to. Presenter, Stephanie, was excellent and gave us a number of new tips, tricks and philosophies to use in our day to day relationships with customers. Her ability to keep us involved and entertained was impressive. The QVM has launched three new TV advertisements which give a different take on MarketLife. It is interesting that The Queen Victoria Market is not mentioned in the ads although the QVM logo does feature. 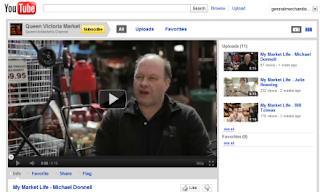 Finally - Michael Donnell, you are a star! Australian retailers pay significantly more than their counterparts overseas according to research by Morgan Stanley. The investment bank compared retailers with similar sales densities rather than make, what they called, futile across-the-board comparisons. The biggest gaps in rental costs are to be found in the speciality retail sector, where Australian retailers pay rents about three times higher (and sometimes more) than similar US business. Australian retailers Westfield Specialty pay US$1428 per square metre, Just Jeans Portmans etc. pay US$1202 while their US counterparts pay US$424 per square metre. Super Retail Group – US$238/sq.m. In its submission to the Productivity Commission, the Westfield Group defended the rents it charges retailers, saying they are a product of market forces. 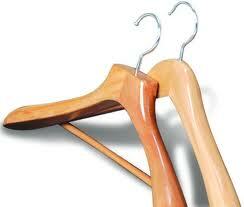 A Japanese clothing store has introduced RFID (Radio Frequency Identification) hangers that interact with the customer. Apparently, when the customer selects an item from the rack ,a nearby information screen lights up with information about the product selected including suggestions for possible add-on accessories. The store says it has introduced the system to cater for customers who try to avoid sales staff but the cynic in us says it is another way of reducing staff numbers. The system has potential for adding music at the appropriate time – say, "You are so beautiful" as a dress is tried on or "Bad to the bone" for a leather jacket. Call us old fashioned but we can't help thinking that good customer service beats this hands down. Whilst we appreciate that the past 12 months have been particularly difficult for the retail sector, this increase is necessary to cover increasing operational costs, rising utilities and other charges (ranging from 8-15% per annum in some instances). As in the past 2 years (where increases have been kept below CPI) we have managed to keep this latest increase to a minimum. In response to the challenging retail environment, we have also increased our marketing spend; raising the market’s profile significantly through television advertising and an increased presence on commercial radio and in daily newspapers as well as in the tourism sector. In all we have increased our advertising spend by over 30% over the last 3 years. We have also assisted stallholders by providing retailer training to keep them abreast of changing trends and to ensure that they are well placed to face these challenging times. We assure you that we are making every effort to contain our costs and to make savings where possible without compromising services. Comment from Anonymous - 23/10/11 "As our rent is so cheap in the first place i would be happy to pay a extra $100 a week to go into a advertising fund to pay for a lot more t.v. adverts to bring in more people to spend money here. I think we would make the $100 back and some." Editor - 24/10/11 "Thanks for your input Anonymous. Comparing rents across Melbourne's retail scene is not easy but if you take the recent Morgan Stanley analysis (http://www.victraders.com/2011/10/world-retail-rents.html) my calculations suggest we are paying about double what JB Hi-Fi and The Reject Shop pay per square metre. More TV advertising certainly has its merits particularly if it can be directed at tourists." Comment from Anonymous - 26/10/11 "Hi Anonymous, rent may be "cheap" for you (and half your luck). But if you talk to many traders, and it seems that it would be a good idea for you to stick your head out of your stall, and have a chat with your fellow traders every now and again, you may find that other traders don't have quite your money to throw around. Oh, and if you work out how much rent we are collectively paying to QVM Pty Ltd/Melbourne City Council each week, they really don't need any more to simply be doing their job! Just another anonymous trader "
This week’s offer is for $100 worth of printer cartridges, plus a $30 voucher (all up $130 worth) for just $29. Apparently letters are in the mail to traders regarding a rent increase. Some letters were received on Monday although your editor has yet to receive his so we don't have details. The word is that traders can expect a 3.5% - 3.7% increase. More information as soon as we can. 1. The Australian Sporting Goods Association has called on federal parliament to toughen up laws on counterfeit sporting goods particularly apparel. 2. Coles has introduced its MIX clothing and accessories line to supermarkets. 3. A new online sporting goods site called Onsport.com.au sells sporting goods, sports tickets and sports packages. 4. Upmarket jewellery store, Bulgari, has opened its new outlet at Melbourne’s Crown Complex. 5. Lingerie maker and retailer, Bendon Group, has bought three Australian brands – Lovable, Davenport, and Kissed. 6. The Australian Retailers Association says that 4 out of 5 retailers think the Carbon Tax will impact badly on sales. 7. Despite difficult trading conditions and the disabling of their main distribution centre in the Queensland floods, The Reject Shop is set to open 20 new stores this year. 8. Ebay has teamed with local and international fashion brands to create an online Fashion Gallery. 9. Ebay launches a mobile phone app that allows customers to photograph a product in store and then buy it online. Where were you raised? Born in Poland raised in Israel. What do you do/sell at the market? Menswear. How long have you been at the market? Since 1976. What do you like best about the market? Interacting with customers. Past jobs ? Manufacturing clothes. Sporting interests? AFL and used to play soccer as a youngster. If you were CEO for a day? Advertising - big promotion. One thing nobody knows about you? I'm a good singer. Favorite food? Italian and Chinese. Favorite drink? Vodka and orange. Favorite TV show/ movie? Sienfeld , Ben Hur. What is the best piece of advice you've ever been given? If you can't interact with people, give the game up. If you had your Sunday arvo free from the market, what would you do? Go to the footy. Who is the most famous person you have met in your stall.? Alice Cooper - he signed my t-shirt. Aldi Wins High Court Case and We Benefit.